The tardy bell will ring at 8:25 a.m. If your child is tardy, please walk with him/her to the Main Office in order to sign-in your child. Follow the cones in the traffic loop through the student drop-off zone; do not divert from the established path. Pull as far forward as possible once you are in the drop-off zone. Stopping in the loop and not pulling as far forward as you can, dramatically slows down the traffic. It is more efficient to have multiple cars able to unload at the same time. This can be accomplished if you pull as far forward as possible and if your children are ready to exit the car once you stop. Students should not exit cars until you have past by the first lamppost in the drop-off zone. 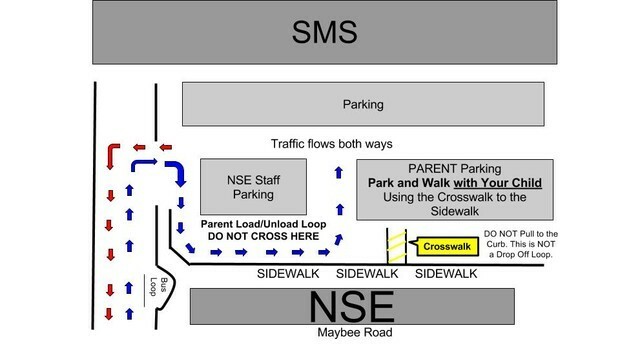 If you would like to walk your child into school, please park in the parking spaces closest to the playground and walk with your child to the sidewalk through the crossing zone area. Drop off students in the bus unloading loop. Allow your child to walk by him/herself to the sidewalk if you have chosen to park in the lot. You must exit your vehicle and walk your child to the sidewalk, however, do not walk into or through the coned area that is part of the drop-off zone. Students riding the bus, will exit the bus in our bus loop and will be directed to enter the gymnasium. On half days, school dismissal is 11:31 a.m. Approximately once a month there will be ½ Day Dismissals on Friday’s. Please review the school calendar for these specific dates. Kindergarten Students: Parents must pick their child up in the cafeteria. 1st-5th Grade students will exit the cafe doors between 3:25-3:30 p.m.
On full days, all students should be exited from the cafe by 3:35 p.m.
Any students still waiting for pick-up at 3:35 p.m. will return to the Main Office, so we can contact parents. Should this become a regularly occurring practice, students will need to enroll in after-school Kid’s Connection program. Students riding the bus are dismissed at 3:30 p.m. to the bus. *Please note: You can expect that bus times will vary during the first couple weeks of school as we are establishing routines and procedures and also during inclement weather.